When trail riding in the winter, early spring, and/or late fall, you can expect to find frozen puddles. The crackling sound of breaking ice often catches horses by surprise, putting the rider at risk of being dismounted when it reacts to the noise. To prevent this potentially dangerous situation, you must prepare your horse before you hit the trail. 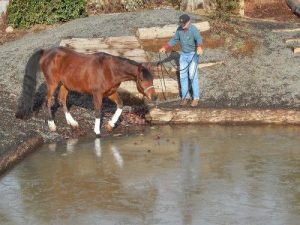 The following step-by-step method of preparing your horse to break ice has been used successfully at Bolender Horse Park. Before you begin, make sure that your “Bolender Bubble” is well established for the safety of the horse and trainer. If this bubble of space has not been established, the horse will want to bolt when it first steps onto the ice and into water, putting everyone in danger. The horse must have no doubt in its mind that you are the leader because it will try harder to please you. It will also calm them down because horses know instinctually that a leader will protect them at all costs. The first step is to find a puddle or pond with at least ¼ inch of ice on it. Make sure that you have wraps on the front legs. While I have never had a horse injured or a cut by ice, it remains a concern. Therefore, I err on the side of caution and use wraps. Also, if you do not want to wait for the cold weather, then freeze a number of ice sheets in cookie trays inside your freezer (you’ll need many such trays). Set the sheets upon crushed ice so they will make a little more noise when stepped on. Next, start from the ground and drive the horse to the water with ice on it. For this, you must ensure that your driving method is well established. Allow the horse to examine the ice and test it. More than likely the horse will draw back when it first steps on it and a noise is made. Allow the horse to move, but hold your position and do not move your feet. Ask for the horse to again examine the ice and then to step into the water. Do not force the horse, but be insistent that it move forward. 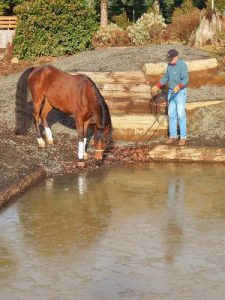 The horse may step back and out of the water several times; this is normal. Simply insist that the horse give it another try. Your attitude should be that the horse can do it, rather than it will do it. It sounds like a small difference, but the horse senses it in your attitude. Your role at this point is that of a teacher who inspires the horse to try, not one who tries to dominate. By remaining focused and calm your horse will also stay focused and calm. Assuming that you have established a leadership role and triggered an instinctual response to please, the horse will continue to try if you stay focused and quiet. Be patient and allow the horse to think it through. 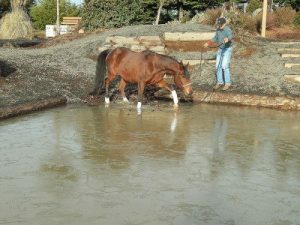 Your patience will be rewarded with the horse taking another step into the water, breaking the ice one step at a time.